Primo Payroll is the only software that takes 100% of the stress of Auto-Enrolment compliance away. True to the name of the legislation itself, Primo Payroll automates the entire process in the ‘real’ sense – probably more automatic than the pension regulators ever would have imagined! As you carry out your usual PAYE processes, our payroll cloud software runs the Auto-Enrolment compliance processes in the background, communicates with your pension provider, completes the assessment and communication responsibilities, automatically classifies and enrols the employees, and calculates the contribution. Even the contribution payments are automatically processed by direct debit. Not a single piece of data needs to be imported or exported! RTI capabilities are an integral part of Primo Payroll. The software not only allows you to submit all RTI submissions such as FPS and EPS, but it also tracks any pending submissions and forces you to complete them. You cannot get away without meeting your obligations to HMRC – it’s as simple as that! Our technical team works with HMRC closely and implements new tax year changes well ahead of time. Enhance your business profile and reduce your administrative work by offering an elegant and secured employee self-service portal. Employees can manage their own profile and download payslips, P60s and HR policy documents. They can also upload personal documents like proof of address and sickness notes etc. 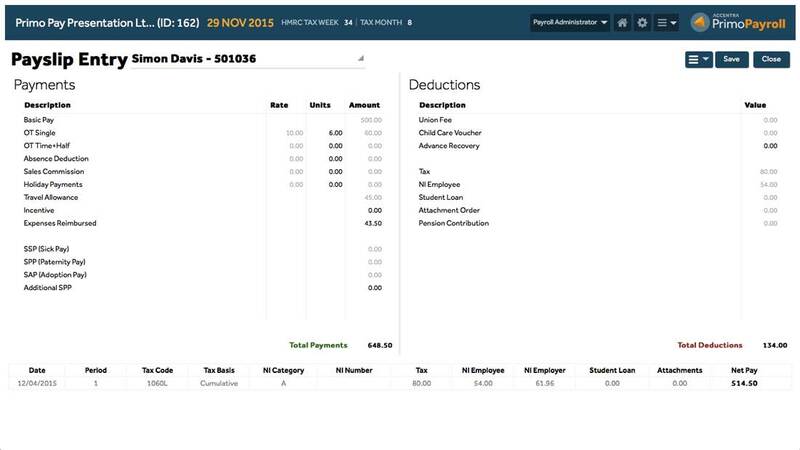 The unique ‘what you see is what you get’ input screen mimics the look and feel of an industry standard payslip layout. The intuitive design provides a familiar layout and the best user experience possible to make new users instantly feel at home. The ‘calculate as you go’ technology intelligently and instantly updates payroll calculations as you key in period variables such as overtime hours. This means that, by the time you have completed your period inputs, the payroll has already been run in the background for you. The ability to input details for batches of employees makes the process fast and efficient for big businesses with hundreds of employees. 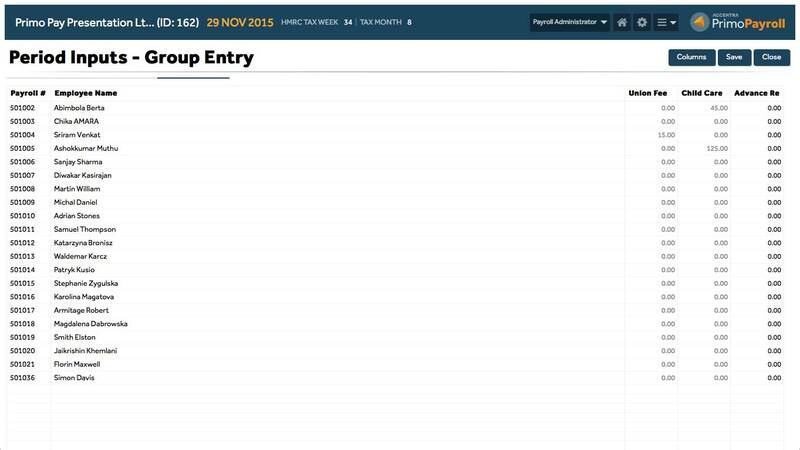 The group entry screen provides a spreadsheet style interface pre-filled with employee details and all the relevant payment and deduction elements. Simply complete the entries and run the payroll. If you already have a process for collecting period input variables such as hours, incentives, and deductions, simply import your existing spreadsheets into Primo Payroll directly. This is particularly convenient if you have a time and attendance system that outputs the employee’s data to a CSV file. In the majority of cases, you will be able to use your existing files, as Primo Payroll can work with various input formats. Our support team will be happy to map your file format for direct input into Primo Payroll. Use the global change screen to alter the pay for basic employees by a certain percentage or a fixed amount. You can also amend and remove payment items for several employees. You can make these changes in different ways for a selected group of employees. Download P6/P9 tax code notifications directly from the HMRC Gateway to your employees’ records. The result is no more paper processing or any embarrassing omissions or mistakes. Automatic verification of employees’ NI numbers with a click of a button. Primo Payroll will provide a list of NI numbers which do not tally with HMRC’s records. You can then review and select employees you want to update. Employers can ill afford to misplace documents such as employment contracts, proof of address, right to work, P45, SSP1 forms, SMP1 and anything else that’s of importance to meet employer obligations and for PAYE compliance. Our system allows you to keep all your employees’ documents in one place and access them at will. Use the built-in email templates to communicate with your employees, either selectively or globally. Primo Payroll will pick-up the relevant employee email IDs automatically and send emails to employees with their names and a greeting. A copy of the emails can be automatically sent to your designated inbox. The emails can be used for a variety of purposes, from informing the employees of a new expense reimbursement policy, to business achievements and even such things as employee of the month announcements. You can also communicate using SMS for quick, concise messages such as budget meeting reminders. Statutory payment calculations such as SSP (Sickness), SMP (Maternity Pay), SPP (Paternity Pay), SAP (Adoption Pay) are fully automated in Primo Payroll, all you need to do is specify the relevant dates. 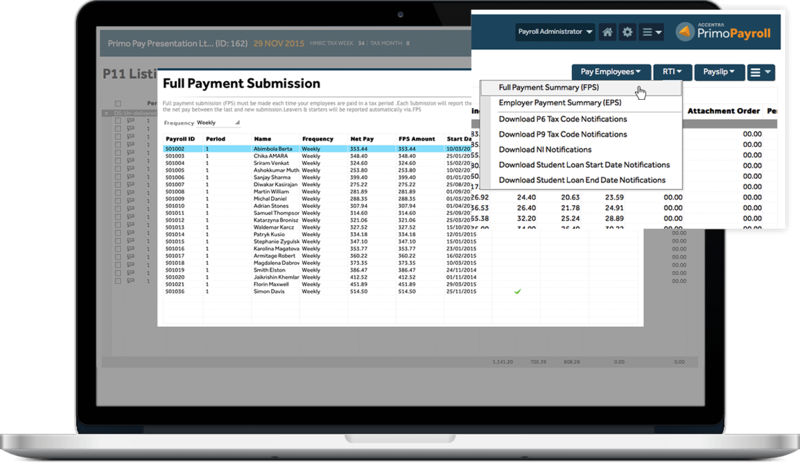 Primo Payroll will use the employee’s historic data to calculate the payment due and when it should be processed, along with the salary calculation for the correct period. All recoveries due will be automatically calculated and submitted via the electronic payment system. Unlike the HMRC calculators, these tools are very simple to use, perform both Tax and NI contribution calculations in a single step, and also tell you how much your employees will take home. Send and resend professional looking, branded payslips to your employees by email. Customise the built-in email templates with your own message, signature and company logo. Payslips can be emailed to the whole company or to selected employees as you please. Historical payslips can also be sent by email. Never lose sight of your historical payroll data or have to rely on data backup or printed hard copies. Every single report is accessible across multiple years and periods for straightforward business reporting and HMRC compliance. To make the process even easier, the reports for past years and tax periods are available on the usual report filter screen. Simply use the dropdown menu to select the year and specify a period. 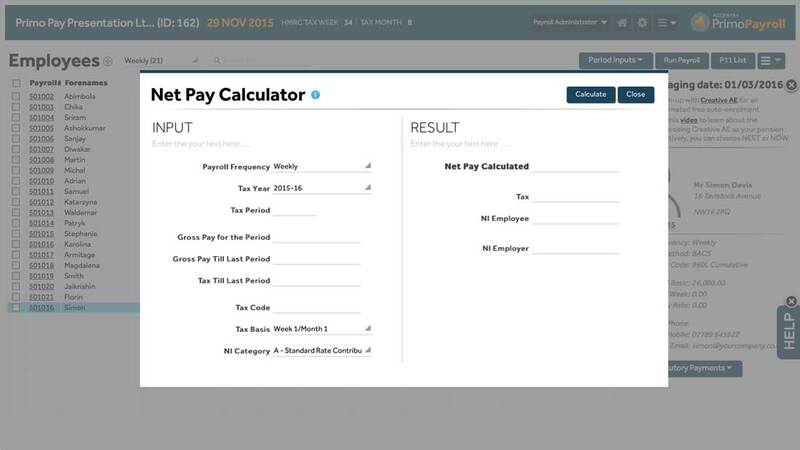 This is payroll cost analysis made simple. It’s not uncommon for management to request payroll summary data for a range of periods. Simply specify the period range on your usual report filter screen and Primo Payroll will summarise the values for each employee and produce a neat and elegant report. 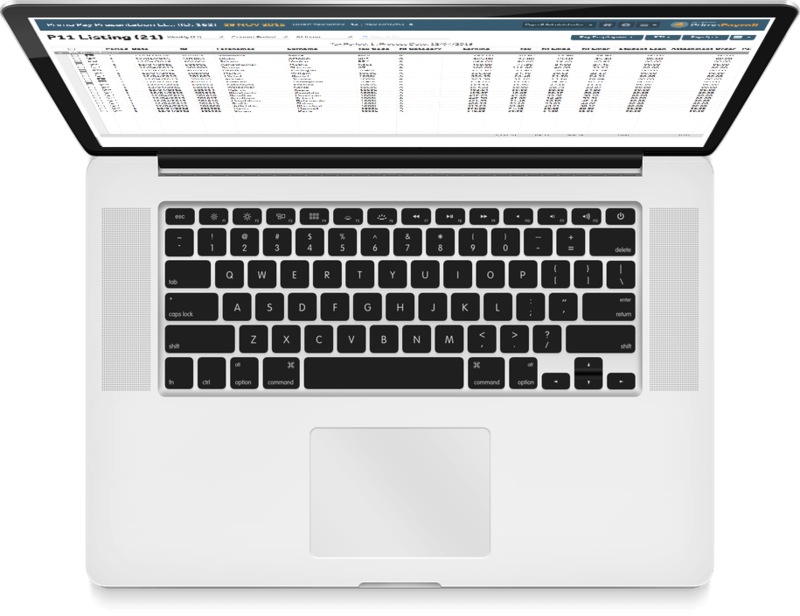 Download your report to a spreadsheet in seconds for the analysis-ready data you need. 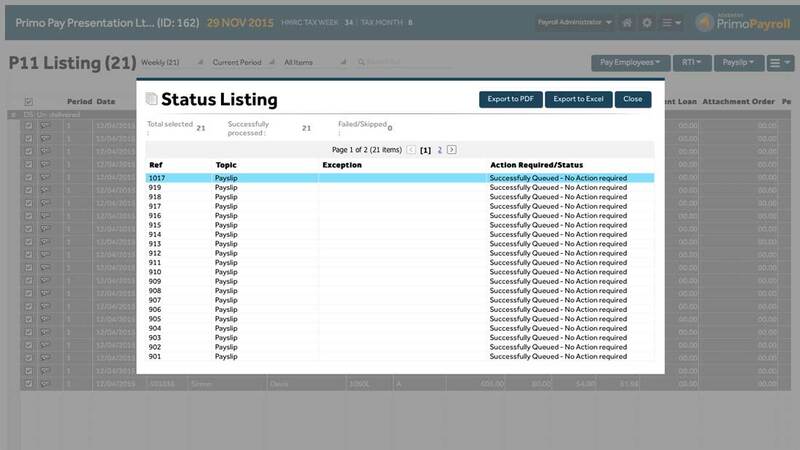 This screen also allows you to take a look at the pending list and complete the tasks without leaving the dashboard. 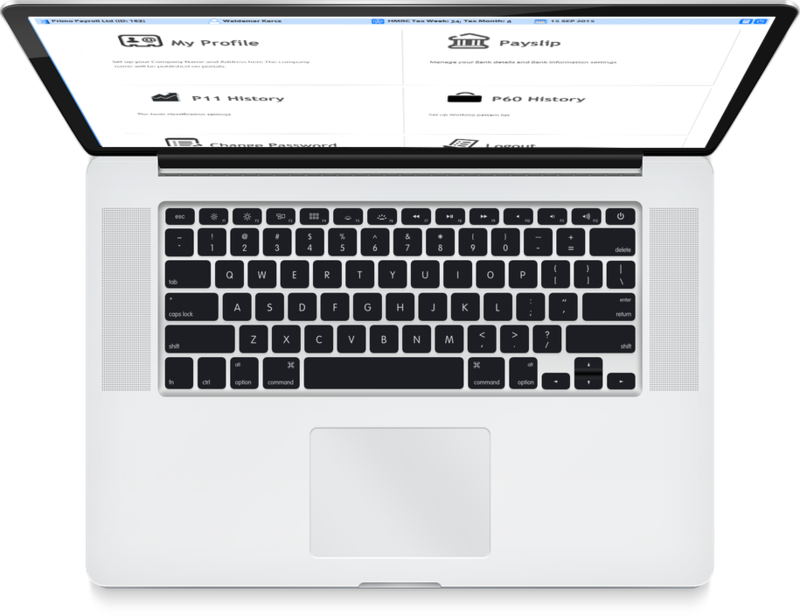 Bureau payroll processing has never been easier than this! Primo Payroll publishes all critical auto enrolment timeline data for your clients on a single screen. 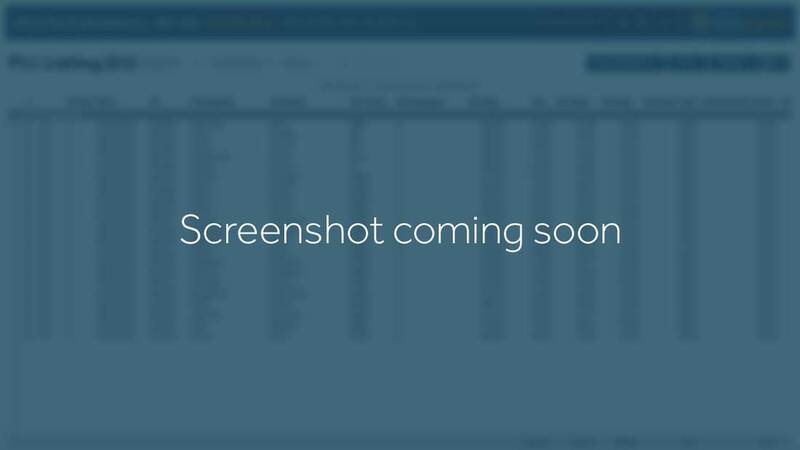 It then allows you to complete pending actions with a simple click. Use the built-in email templates to send out personalised emails branded with your business logo and signature. Alternatively, send quick, concise messages to your clients using the bulk SMS facility. 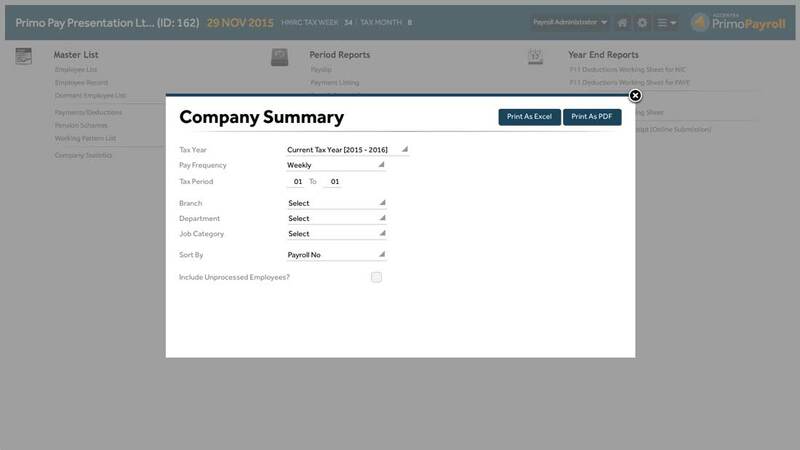 Is one of your clients sitting on their payroll data for tomorrow morning’s payroll run? No problem, Primo Payroll knows who they are. Simply click ‘Remind’ to send them an instant email or SMS. With hundreds of clients on your account, billing and collecting the money you are owed is the lifeblood of your business. Primo Payroll allows you to set up multiple service levels each with their own billing parameters, such as a fixed monthly fee, plus a fee per payslip. When a client signs up to your service, tag the client to a service level and billing frequency and leave the rest to Primo Payroll. Your clients will be billed promptly and accurately. The billing data is exportable to CSV files for use with your favorite accounting system.